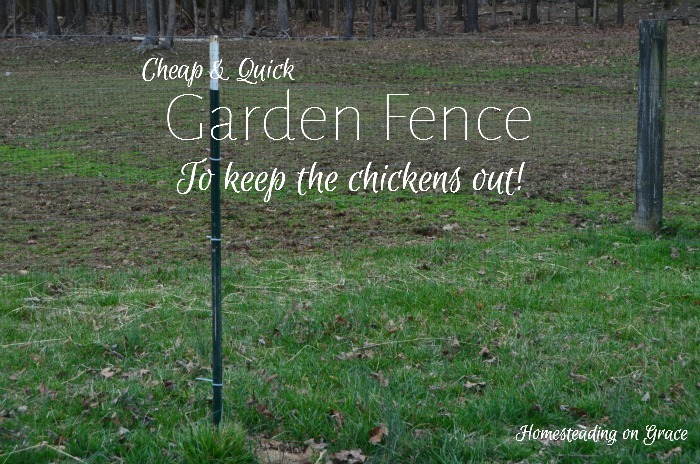 One of the things I needed to do for my garden's potential success was to put a fence around it before the chickens ate all of my new plants up. (They've done it before, dadgum chickens.) We had several t-posts laying around, so I decided to get my fence started. I didn't want to ask Jeremy to do one more thing for me since he's already done a lot here lately. I figured Gideon and I could figure this out. Not proud of that. Not one bit. Jeremy must have felt bad for us. He decided to help us get it done. First we borrowed a post driver from my Dad. (And some ear muffs, because, boy, is that loud!) That thing makes it quick! I was even able to do two posts with the driver. I did pull something in my back, though. Ok, back to the fence. Jeremy drove those t-posts into the ground. We used one in each corner, one in the middle of each side, and an extra one on one side to make the gate/entrance way. Jeremy priced the fencing at Lowes. I've said it before, and I'll probably say it again. We aren't rich. So when Jeremy said chicken wire was $40 for 50 feet, I asked if there was another way. So he went back to looking through the shelves at Lowes, and found this fencing. It's really more like nylon mesh netting, but it's 7 feet high, and only cost $15 for 100 feet at Lowes. Our garden is around 150 feet around, so we needed two rolls. $30 would not break the bank, $120 would. We tied it to the posts using zip ties , stretching it pretty tight in between each post. Our posts are not 7 feet tall, so there is an overhang. It's been out there a week now, and so far the chickens are leaving it alone. It's really hard to see, and because it's mesh, it's not stiff enough for them to land on. Even though they could fly over it, I don't think they'll attempt it because when they fly over the goat fence, they land on the fence first. They can't do that with this mesh fence. The plan is to let them in under supervision once the plants are well established to help with bug control. The gate (shouldn't really call it that) is just the leftover roll leaned up against the other side right now. We still haven't quite figured out how to fix that up a bit, but it works for right now. And we got this fence up just in time because look at what's growing! It's my pea plants coming up. I'm so excited. God's been walking through my garden. Such a lovely thought. Nice improv :-) . I use something similar to that to keep the birds out of the strawberry patch. It works great until anytime there is any free-standing water in the patch. I swear my chickens don't care about the water they have, they will do anything to get to the water I don't want them to have. I love that you are letting your chickens in your garden for some organic bug control. Mine do well once the plants are established if I can keep them from trampling strawberries. I have to take them back out once the corn ears start developing though because they eat the corn almost as fast as the raccoons do :-) . If you have as many pallets as we do, they make great lean-to doors. We had another snow storm today, so it's always refreshing to come see what you are doing. I saw the picture of the snow on your farm on Facebook. So, so much snow! We haven't done strawberries yet. I don't think this will be our permanent garden spot, so I hesitate to put any perennials out. And it's not a big enough spot for corn, but we have a farmer at the farmer's market to buy from. Last fall the chickens ate all of our young plants, but left the older tomatoes that I purposely left up for them. And I do have access to a pallet, that's a great idea for a door, thanks! I want to put a fence around our gardens but money is tight for us to so we haven't yet. We are in the process of building a pallet fence for our pig though. I want to see your pallet fence when you are done! We've got to figure out a fence for the future pigs, and I've toyed with the idea of a pallet lean-to for their shelter, but I haven't considered pallet fencing. That is a lovely thought at the end! Best wishes for your garden! We did use that cheaper nylon fencing one year to keep the chickens out of the garden. It did work, until they realized that they could slide under the mesh in the long side. Over time the mesh becomes more loose, and if the t-posts are far apart, the chickens can slide under the "fencing". We fixed this by using some of those bamboo garden stakes to stake the fencing down in longer sections. Good luck! Jeremy thought about that too, but we haven't done anything yet. He wants to add some ground stakes around if the chickens figure out how to get in. So far so good though! Maybe a cat? :) We have a few cats now, although we don't have to do anything for them. They've come out of the woods, and hang around the trashcans at night. I'd love it they would keep mice from coming into our house. Hope you're doing well Margy! I need this. My dog likes to lay around in my garden until it get full of plants, but I don't want her in there since I just planted seeds! I found you from Reviews, Chews and How tos. I didn't know you could get mesh fencing like that. So awesome! Thanks for sharing at the Homestead Blog Hop this week. Great job! I always use the deer netting above my chicken runs to keep the hawks out. Works great! 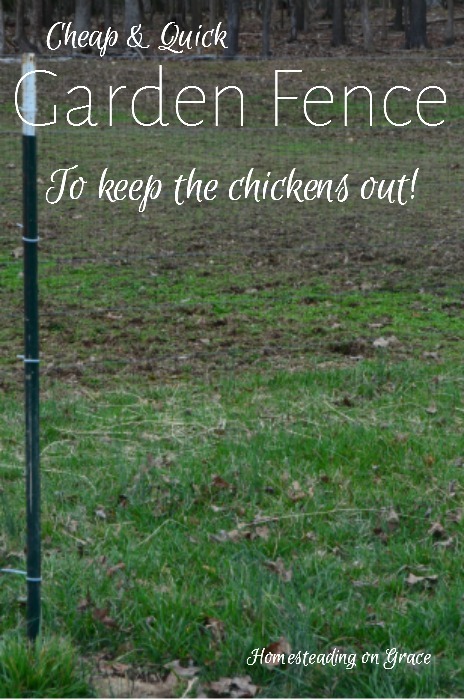 I think I'll try this with my raspberry bushes this year.....dang chickens get them every year!